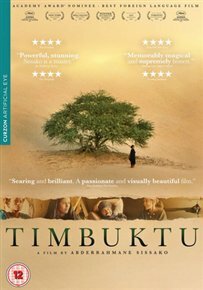 Set in the Malian city of Timbuktu during the jihadist takeover of the country in 2012. The film chronicles the impact of the citizens living in the city after Islamic militants arrive to implement their extreme doctrine, which begins with the destruction of many of the inhabitants’ cultural heritage sites. Amongst those that clash with the new regime are four people who are arrested for making music and have their female singer Fatou (Fatoumata Diawara) subjected to 40 lashes. The local imam (Adel Mahmoud Cherif) pleads with the intruders to abandon their crusade and spare his people but has his protestations ignored. Meanwhile, just outside the city in dunes previously free of jihadists, a cattle herder (Ibrahim Ahmed) and a fisherman (Abel Jafri) become embroiled in a struggle that brings jihadist judgement upon them.